Enjoy your first Monday of freedom chicksta. Shows my ignorance emzap - hope you've caught up on your sleep. Lyrics: no, but sound both familiar and appropriate. Yesterday's lyrics were Captain Sensible with "Happy Talk". Originally from the South Pacific musical. And I'm trying to be sensible. Why: may have taken leave of my senses as this will be the longest run since records began. (Well since May 2017 anyway). Must take a look at some more of the Adrienne yoga clips. Lmh I also always thought that. It's a long way away so it feels like there should be a big time difference! I would so like to be by the sea at the moment emzap - I'm very envious. I think you'll be fine Alehouse. What: 9k run commute. At a higher pace than planned. Why: Gotta get them miles in. Enjoy your free Monday Chicksta. Nice long run yesterday. Hope you can get that Next issue sorted soon RFJ. Why - recovery. Saturday was County XC. Never expected to be as quick as last year even allowing for a runnable course rather than the gloop of last year. 7.2 miles of hard running with no real issues so on that basis it was pleasing. Well beaten by club mates and rivals that I'd normally be in front of, but I half expected that. The highlight of the day was a bronze medal for our Vet Men's team to go along with team medals in U17 & U20 age groups too. 16 very easy trail miles yesterday. Why: following M73. Will see tomorrow if I survived it; Achilles and calf weren't happy with a couple of ks on grass at one stage but felt better on firmer gravel. Grey weather and we both wore plenty, although the gloves did come off around half way. All went well no problems and no Christmas lights to brighten up a dark morning. That's just a mobile phone photo from inside the car at local bay. 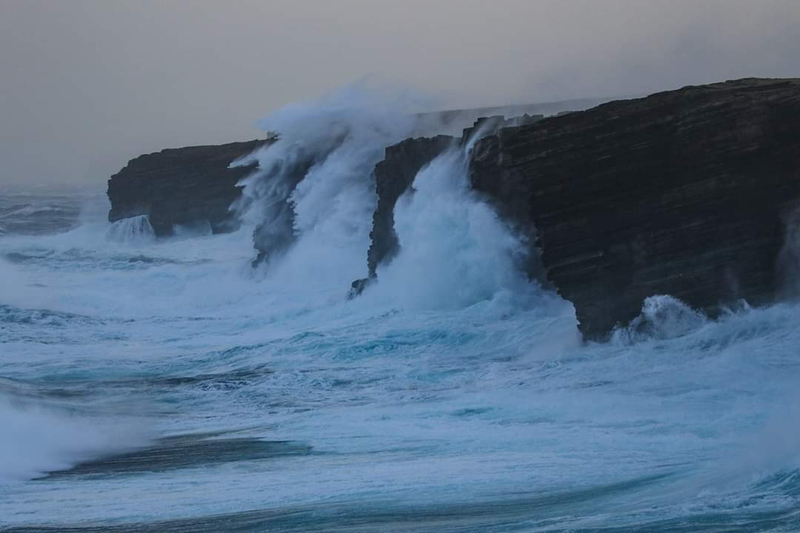 This is what it looks like on West coast of Orkney today (friend's photo). These cliffs are about 200 feet high. alehouse, nice amount of minutes! hazel hope the 13 goes well! epsen, have a good run too! Glad there are no ill effects from the fall, Wabo! Will you be open water swimming then, OH? And hope you are making the most of your four day week, Chick. I very rarely work Mondays and ideally it will be my long run day. Emz: I know what you are saying there, dogs are allowed on our beach during the months Oct-May, as they are off leads I get chased or charged by a dog on at least every other run down on the beach/prom, most often they are just excitable things, but sometimes there are some that are very aggresive. I did get three charges in one run recently, that's the current record. 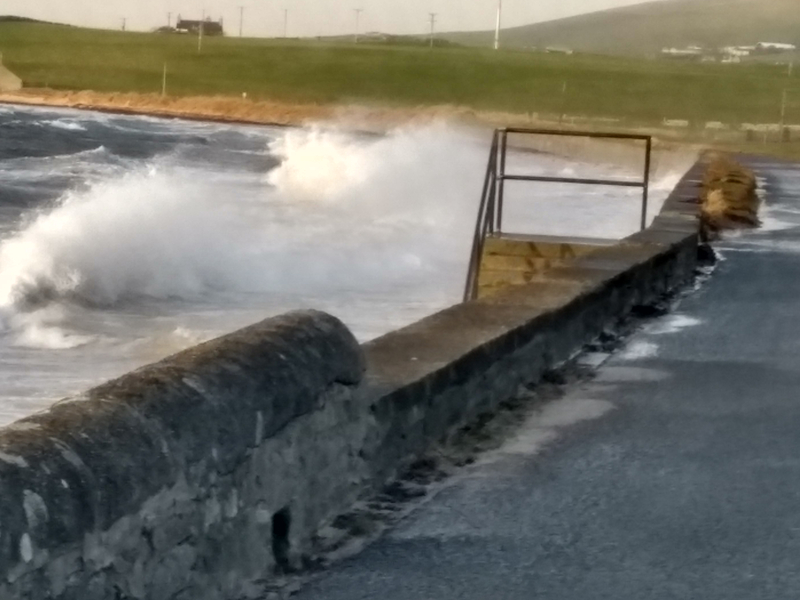 OH: Impressive seas, I love when the sea is doing something, I liken it to a giant kettle element having being put in the bay. Ale: Cracking result, well done. Wabo: Poor you, sorry to hear your fall, but glad no long term harm. Dustin: Great 16 miles there, I really want to get out for a 10+ blast, inspired me to aim for that at the weekend, although next couple of weekends may be busy so have to wait for the (actual) dust to settle.and all decoration done on the house. LMH: Run Conundrum, I hate that, often it is want to go far not enough time or shall I go morning or afternoon, what if morning drags on then I might miss chance. Hazel: Go for it! Get that 13 miler conquered. What: Supposed to be gym day, but I'm a run day down so have mixed them together to make an energetic Spritzer. Quick gym session of half normal time done and then when daughters at netball at half-four will go for a run of whatever distance I can do in that 50mins-60mins timeframe while they play. I feel very blessed to be able to work part-time now. You can get so much more done although today was mainly chauffeuring duties to get mum and dad to their respective doctor's appointments and buy mum a new smartphone. Good running ale, espen and poppy. The miles are building. Wow, OH - that FB pic looks savage. I love the sea when it's wild. Wouldn't want to go in though We're forecast another storm tomorrow. Will you be trampolining too, wabo? 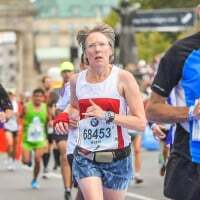 Hazel: hope the fast finish long run goes well. Do you always run long on Mondays? Nice weekend running Dustin and congrats on the team bling. Em: Aww, swimming with a seal - how lovely. chick, no I will be watching in awe!! Beautiful pictures OH - I'd love to be walking by that at the moment - well wrapped up though! I must have missed your fall Wabo, glad you're ok. What is Tiffany cake? Hope there is no adverse reaction Alehouse. I'm just not doing decisions very well at the minute Benjy, brain still addled from lack of sleep and too many things to think about I think. Hope you had a good run. That sounds like a tough run Hazel. Were you running late espen? My run cleared my headache (more effective than any painkillers), work were fine about Friday, student I should have seen is fine, MiL has had an ok day, we're nearly through another one. Good to read your XC report Dustin, you’ll be back beating them in no time. Two separate 4 mile runs for me today. Wanted to hit the ground running at work and had a few presentations to do so I figured if I was more awake than the audience, that would be a start. Used a head torch for the first time in forever so managed to get out on quiet country roads, which was nice. Then 4 miles post work as well. Well done on the XC results Dustin. Hope the leg holds up Alehouse. Great pics OH thanks. Looks pretty wild! Glad the headache is better LMH. Hope you could squeeze in a nice run Benjy. Hmm cake - Wabo, you have just reminded me there is a slice left here! Well done on the 8 WP. My 13 progressive turned into a 10 progressive + 3 recovery-easy in 1:47 as I overdid the progression in the early miles and had little left in the tank for another 3 miles at LT pace. Need to pace such a run better. Not unhappy with the overall result though as it was the first finish fast longer progression I have tried. Rest day tomorrow. Monday just happened to be my long run day this week Chicksta, I try to stick to P&L but sometimes have to juggle. I work part-time so could slot it in this afternoon. Can also be good to have a Sunday free for non-running activities with OH. Sounds like you learned lots on that run, Hazel! And good that you are not disappointed with it! Solo half marathon at a decent pace at this time of year: keep it up! How undulating is it around where you are? Legs feel remarkably good at the moment: hope I can say the same in the morning! Hope back to work went well, Don! I'm back tomorrow. And Wednesday. Then that's it for the week! Sounds like a good week! Today was good, really enjoyed it actually, great to be back.